The clutch pedal must be depressed when braking on a vehicle with manual transmission, when the vehicle is in gear and at low revs. If you fail to do so, the functionality of the brake servo can be impaired – there is the risk of an accident. If a front spoiler, full wheel trim, etc. is mounted retrospectively, it must be ensured that the air supply to the front wheel brakes is not reduced. The front brakes may overheat, which can have a negative impact on the functioning of the braking system – there is a risk of an accident. When leaving the vehicle, never leave persons who might, for example, release the handbrake or take the vehicle out of gear unattended in the vehicle. The vehicle might then move off – there is the risk of an accident. Observe the recommendations on the new brake pads » page 110. Never let the brakes slip with light pressure on the pedal if braking is not necessary. This causes the brakes to overheat and can also result in a longer braking distance and excessive wear. If the brakes are applied in full and the control unit for the braking system considers the situation to be dangerous for the following traffic, the brake light flashes automatically. After the speed was reduced below around 10 km/h or the vehicle was stopped, the brake light stops flashing and the hazard warning light system switches on. The hazard warning light system is switched off automatically after accelerating or driving off again. Before travelling a long distance down a steep gradient, reduce speed and shift into the next lowest gear. As a result, the braking effect of the engine will be used, reducing the load on the brakes. Any additional braking should be completed intermittently, not continuously. The wear of the brake pads is dependent on the operating conditions and driving style. The brake pads wear more quickly if a lot of journeys are completed in towns and over short distances or if a very sporty style of driving is adopted. Under these severe conditions, the thickness of the brake pads must also be checked by a specialist garage between services. The performance of the brakes can be delayed as the brake discs and brake pads may be moist or have a coating of ice or layer of salt on them in winter. The brakes are cleaned and dried by applying the brakes several times. Corrosion on the brake discs and dirt on the bake pads occur if the vehicle has been parked for a long period and if you do not make much use of the braking system. The brakes are cleaned and dried by applying the brakes several times. If it is found that the braking distance has suddenly become longer and that the brake pedal can be depressed further, the brake system may be faulty. Visit a specialist garage immediately and adjust your style of driving appropriately as you will not know how great the damage is. An insufficient level of brake fluid may result in problems in the brake system. The level of the brake fluid is monitored electronically Brake system. The brake booster increases the pressure generated with the brake pedal. The brake booster only operates when the engine is running. Pull the handbrake lever firmly upwards. 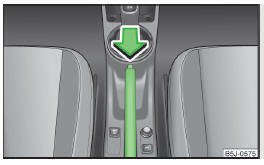 Pull the handbrake lever up slightly and at the same time push in the locking button » Fig. 103. Move the lever right down while pressing the lock button. The handbrake warning light lights up when the handbrake is applied, provided the ignition is on. Please note that the handbrake must be fully released. A handbrake which is only partially released can result in the rear brakes overheating. This can have a negative effect on the operation of the brake system – there is a risk of an accident. After the vehicle has come to a standstill, always engage the handbrake firmly and then engage the first gear (vehicles with manual gearbox) or move the selector lever to the P position (vehicles with automatic transmission).